Edited by Ute Roessner . 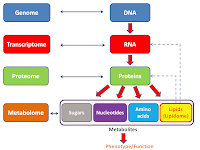 Metabolomics is a new scientific field which has developed with an accelerating speed over the last decade as demonstrated through the increasing numbers of publications in scientific journals of any biological research field. These developments are mainly driven by increasingly robust and sensitive analytical instrumentations allowing the analysis and quantification of thousands of metabolites from any biological system. Together with the application of sophisticated computational methodology and statistical approaches the vast amount of data generated from instrumentation can be analysed and mined aiding biological and biochemical interpretation. Especially, once experimental metabolomics data can be integrated with other ‘omics type data such as from genomics and proteomics analyses the path is paved for a better holistic understanding of the biological system under investigation. This book will provide the reader with summaries of the state-of-the-art of the technologies and methodologies, especially in the data analysis and interpretation approaches as well as gives insights into exciting applications of metabolomics in human health studies, safety assessments and plant and microbial research.